Qandeel Baloch’s biopic is a commendable project. But will it represent her accurately? I won’t lie. When I first saw Qandeel Baloch’s life was being adapted into a biopic, I felt apprehension in my gut. My reaction was instant. Qandeel Baloch died in 2016 at the age of 26 years old. She died last summer while I was working in Dawn’s office, just a couple days after Dawn Images interviewed her about girl power, and I spoke to a coworker about Qandeel and feminism. Qandeel’s death felt sudden, visceral, and real. And that was exactly why I now felt aghast at the prospect of her life being adapted into a biopic, not even a year after her death. That’s not to say biopics shouldn’t be made about people who are dead, or even those who are alive, to preserve their legacy respectfully. Nothing is sacred in the realm of the art world, where everything deserves to be portrayed, contemplated, and understood. As a writer, I understand the importance of positive representation onscreen. But I am also interested in ethics and impact. While the efforts of the film, Baaghi, appear to be sincere, it’s way too soon for Qandeel’s life and death to appear onscreen when we’re still in the dark about what exactly happened. There has been journalistic investigation into who Qandeel was, and how she died. Sanam Maher’s biography on Qandeel is slated to come out this year. Maher, a longtime Karachi-based journalist, has done research and reporting from Multan and Qandeel’s hometown of Dera Ghazi Khan and spoken both to authorities and people who were close to Qandeel. 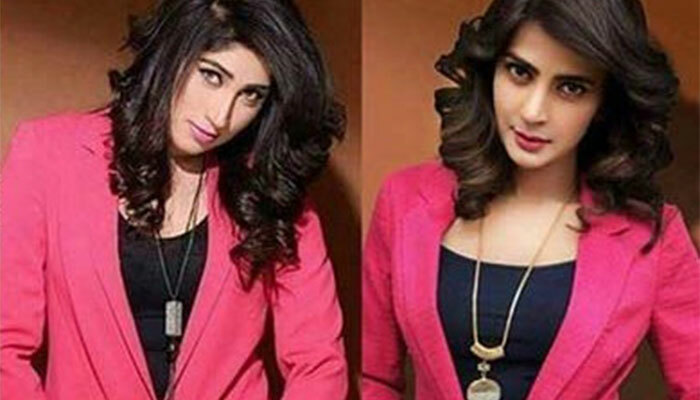 Actress Saba Qamar (right) plays the infamous Qandeel Baloch (left) in Baaghi. After Qandeel died, there was an outpouring of grief and introspection from journalists who had covered and worked closely with her, most notably Dawn’s Hamna Zubair and AFP’s Issam Ahmed. There’s no evidence the producers or screenwriters of Baaghi consulted these journalists or anyone else who has attempted to make a historical record of Qandeel’s life. And while Qandeel’s family signed off the rights to her life story, it’s worth noting the producers still weren’t able to access her family because they were busy with legal proceedings for the murder case. What made Qandeel unique as a celebrity was her background as a woman from the rural periphery in Pakistan. It’s perfectly possible her family may have sold the rights because of the money they would get from it, not unlike most impoverished people in Pakistan who find themselves under sudden media spotlight. Qandeel’s family had apparently not been interested in speaking with the producers, but only sent a lawyer to discuss money when buying rights was brought to the table. Maher also questioned the claim Qandeel’s family lacked availability to give interviews that could help with research for the show. While Maher said she couldn’t judge Baaghi because she didn’t know the circumstances of the producers’ research, she wouldn’t have minded sharing notes if they had approached her. But while meaningful conversations are the cornerstone of transformative media, it requires a certain responsibility to adapt real people to the TV or movie screen. The best fictionalized media tackling sensitive issues has often conducted in-depth research and interviews with people affected by the subject in question. Endless interviews with journalists and editors at The Boston Globe to produce the Oscar-winning film Spotlight and Neil Biswas and Channel 4’s “intense year of first-hand research” with the Pakistani community in Bradford for their film about the 2001 riots, are both potent examples. And if accuracy isn’t a priority, if Qandeel Baloch is nothing but a template for a drama serial driving in views and cash, then what is the point of portraying her life story onscreen? Is it wholly respectful to dramatize Qandeel when she’s barely cold in her grave? Is it in fact transformative to relegate her to the realm of fiction before a feature-length documentary about her has been aired? If Qandeel is fiction, Qandeel becomes spectacle. And spectacles are easy to forget. Living people are not. 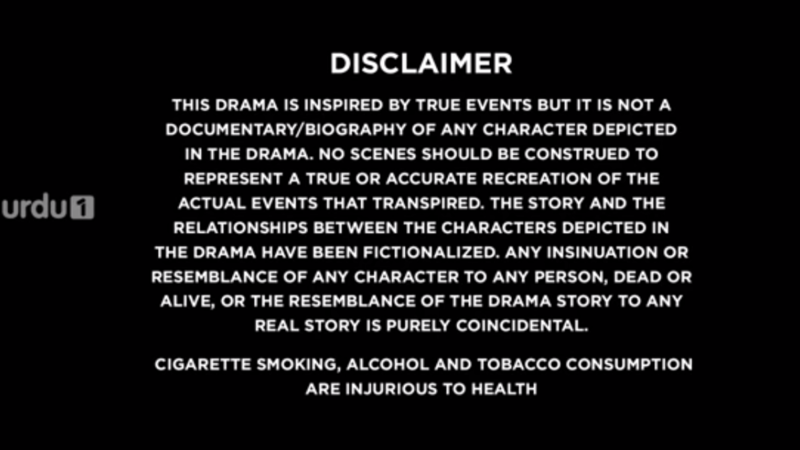 This warning appears at the top of episode one, via Dawn. Qandeel lived. Qandeel died. And Qandeel lived again. She lives in the guilt of our imaginations, which finds it easier to engage with her in a furtive drama featuring mainstream stars and an established screenwriter than we ever possessed the courage to do in real life. Even after having died, Qandeel is real. The family that mourned her is real and also relatively powerless to control any representations of their daughter onscreen on account of their class. The people who killed her are real. And her legacy, ever evolving and transient, is real. But it’s doubtful if the people making this biopic about her, the ones who kept her locked out of this same industry when she was alive, actually realize that.